Nine meteorites of TkW 4010g were found early 1999 in the sand desert of DaG, within a few feet in Al Juffrah. The biggest individual was a complete individual of 3090g, with perfect orientation and fresh appearance. DaG 1037 is one of world's biggest Martian meteorites! The olivine in DaG 1037 is interesting in appearance. It reveals that it was heavily exposed to a major impact shock event on the Red Planet. The numerous impact shock veins, melt veins + melt pockets suggest that this specific rock material was exact the zone on Mars that was hit by an asteroid that caused the material to leave Mars! 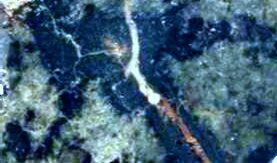 Large vesicles of up to several mm covered inside with fresh black fusion glass on its walls can occasionally be found! DaG 1037 is considered quite fresh material! The name Shergottite describes interesting meteorite material that originated from Mars .Martian meteorites have been launched from the surface of Mars by an asteroid impact. The pieces then orbited the sun and hit the Earth as meteorites. The mean distance between the Earth and Mars is approximately of 78,300,000 km., that is, roughly half the distance from the Earth to the Sun. As compared to the Moon, which is some 380,000 km away, Mars is at appr. 200 times the distance. The SNC's have always been the most desired meteorites for collectors and also some of the most valuable. This gemmy stone consists primarily of olivine, chromite, pigeonite , augite, orthopyroxene. Classification and mineralogy ( Humboldt University Berlin: A. Greshake and M.Kurz): an olivine-phyric shergottite with porphyritic texture; large chemically zoned olivine megacrysts are set into a fine grained groundmass composed of pyroxene and maskelynite; minor phases include chromite, Ti-rich chromite, sulfides, phosphates, and small Fe-rich olivines; olivine megacrysts often contain melt inclusions and small chromites; pyroxenes are dominantly chemically zoned pigeonites, some contain orthopyroxene cores; olivine phenocrysts, Fa31.4-41.1, Fe/Mn = 52-59; matrix olivine, Fa37.4-40.6, Fe/Mn = 52-58; pigeonite, Fs23.7. Although this material is likely to be paired with DaG 476, DaG 735, DaG 975 is looks different in texture and displays quite unique features.